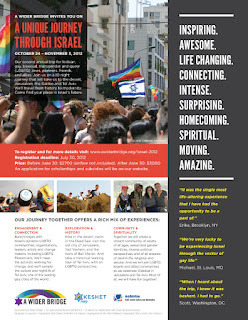 JOIN US ON A TEN NIGHT JOURNEY THAT WILL TAKE US TO THE DESERT, JERUSALEM, THE GALILEE AND TEL AVIV. WE’LL TRAVEL FROM HISTORY TO MODERNITY. COME FIND YOUR PLACE IN ISRAEL’S FUTURE. I hope to be able to join this trip. I received some great news from the organizers about scholarship, now I just have to figure out the logistics of purchasing my own ticket.